Welcome to the X17 Multi-Anvil Facility! The Multi-Anvil Cell X-ray (X17 MAC) facility at the National Synchrotron Light Source (NSLS) is one of the leading dedicated high-pressure beamlines in the world. The X17 MAC facility is best known for the development of high pressure and high temperature experimental deformation/rheological techniques and in situ ultrasonic interferometry expriments at extreme conditions. The X17 MAC facility is located on a superconducting wiggler beam line (X17B2) and contains two Multi-Anvil presses; a 1000-ton press with various compressional modules (BAM11) that utilizes white X-Ray beam, and a side station with a 200-ton modified Paris-Edinburgh style press that utilizes monochromatic X-Ray beam (B2SS). The X17 MAC facility also has a fully equipped sample and experiment preparation laboratory on-site that is maintained by beamline staff, as well as preparation facilities at Stony Brook University that are maintained and operated by the Mineral Physics Institute. These preparation facilities are available to facility users. 1. Provide and maintain a state-of-the-art community facility for high pressure research in mineral physics and materials sciences. 2. Continue to develop new techniques and enhance existing techniques focusing on the unique strengths this beamline provides to the users of the Multi-Anvil community. 3. Play an active role in the devlopment of a world-class high pressure program to be implemented at the forthcoming NSLS-II that will take advantage of the unique features this new facility will provide. 4. Design and commission a new multi-anvil X-ray bending magnet beamline (6BM-B) at the Advanced Photon Source of Argonne National Laboratory in Illinois. Types of Materials Studied: Minerals, Metals, Glasses, Melts, Oxides, Silicates, Ceramics, Energy Materials, Hard and Superhard Materials, Single Crystals, Polycrystals, and much, much more! Publication and Presentation Acknowledgments: "Use of the National Synchrotron Light Source, Brookhaven National Laboratory, was supported by the U.S. Department of Energy, Office of Science, Office of Basic Energy Sciences, under Contract No. DE-AC02-98CH10886. 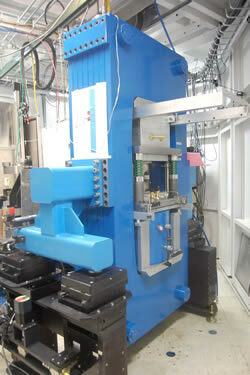 Use of the X17B2 beamline was supported by COMPRES, the Consortium for Materials Properties Research in Earth Sciences under NSF Cooperative Agreement EAR 10-43050 and by the Mineral Physics Institute, Stony Brook University." Old X17B2 Website: Old MPI X17B2 Site - Some documentation can still be found here as the new site is updated. Operated by COMPRES (COnsortium for Materials Properties Research in Earth Sciences) and the Mineral Physics Institute.